Thomas Outdoors Watersports is located on the waterway in North Myrtle Beach, nestled in between the small fishing village of Little River and Cherry Grove Beach. With over 25 years in the watersports industry we can confidently say that we offer the Grand Strand's finest in watersports rentals. Our staff will make you feel safe and comfortable. You will take home not only great memories but great friends. Take yourself away from all of the hotels and busy roads and get swept away into the pristine natural environment that North Myrtle Beach has to offer. We will show you a different side of the Grand Strand that you will appreciate for years to come. 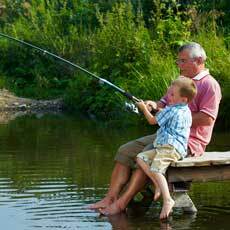 At Thomas Outdoors we offer something that everyone will enjoy, young or old. There are pontoon boat rentals if you are interested in coasting around on the waterway or you can pack a cooler and cast a reel on our small fishing boat. How about In-Shore fishing with Captain Mark? Or how about some exercise and excitement in our new ocean kayaks!